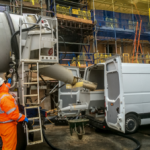 A highly efficient successor to conventional sand and cement screed, liquid screed (also known as flow screed) offers significant advantages to the building trade. 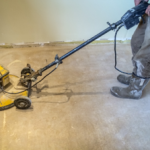 Whether in a new build or as part of a renovation project, liquid screed can be used in both commercial and residential applications. It is designed to provide a smooth level surface in both commercial and domestic buildings prior to the application of finished floor finishes and is fast becoming the popular choice for use with underfloor heating giving you an exceptional and professional finish. 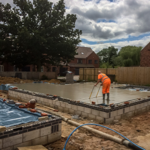 The growing demand for liquid screed has been party determined by the increased demand for underfloor heating systems and for a solution that is quicker to deliver, more cost effective to supply and provides enhanced performance. Generally, it can be laid substantially thinner than conventional materials. It flows into whatever shape is required whilst filling all gaps and voids and it is accurately laser-levelled to a precision of equal to or better than surface regularity SR2. 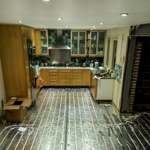 With almost twice the thermal conductivity of a traditional, thicker screed, any underfloor heating system which sits within the screed wastes very little heat and offers reduced energy consumption. 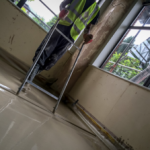 The demand for liquid screed has also been heightened as it offers a finished floor surface that has extremely low shrinkage; that does not curl and that minimises the risk of cracking. 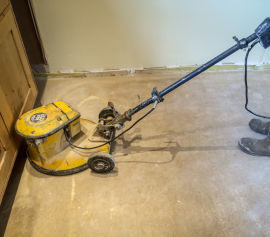 This new generation floor screed is pump applied (we do have a screed pump for hire service if that’s of interest) and combined with the reduced thickness up to 1000m² can easily be laid in a day. The resulting surface is ready to walk on within 24 to 48 hours, so providing minimal disturbance to other trades on site. Combined with the flexibility to force dry the floor, these factors all contribute to reduced project timelines. 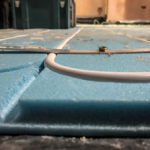 In addition to reduced energy costs for the end user, by using a liquid floor screed the amount of carbon dioxide involved in an installation is significantly reduced. Up to 36% of the product is made from recycled material, and gypsum content makes it exceptionally kind to the planet as the amount of CO2 produced is far less than traditional sand and cement. This offers benefits to companies wishing to tap into a customer base that is increasingly demanding environmentally friendly building processes and materials. Of course, we will help you every step of the way, but we have put together a useful document for the preparation of the site and the aftercare required. 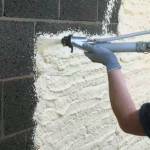 HAVE QUESTIONS ABOUT LIQUID SCREED FLOORS? ASK OUR EXPERTS.